I took delivery of a new 2015 Grandby Front Dinette Model about a month ago. 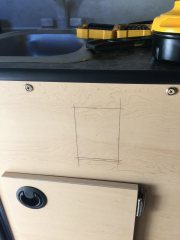 I was ready to setup the 12 volts system to my camper and here is how I planned it out. Hopefully this helps some of you who are looking to do the same thing. My last setup had a wonderful battery/solar/monitor setup and I wanted to make this one similar in performance. 1- How much power am I going to use in an average day? 2- Do I have enough battery power to make it at least 1-2 days without any power coming in? 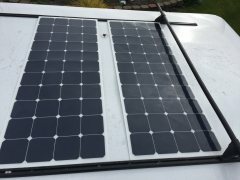 3- Is my solar enough to charge my batteries and run my system during the day time hours? How much power an I going to use in an average day? My new Grandby has the same fridge and furnace. It does have a few more LED lights but those are pretty minimal power users. I use an average of 50 amps per day. Do I have enough battery power to make it at least 1-2 days without any power coming in? 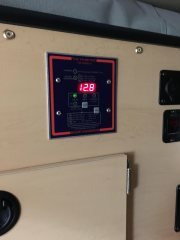 I have calculated that I need about 50 amps per day (maybe less) of energy to run my system without an issues. I can safely discharge about 50-60% of my battery bank without damaging it. So I would need at least 200 amp hours of battery power. Is my solar enough to charge my batteries and run my system during the day time hours? During the day time hours when it is warmer, my fridge cycles on more often. I use some lights and occasionally charge items during the day. With those needs, I could be using up to 5-6 amps at a time during the day. My solar would need to overcome that plus recharge my batteries. In Idaho I would get 5 solar hours a day. To recharge my system I would need to generate at least 10 amps per solar hour and 15 amps would be ideal. There is some voltage loss from the controller, wiring, etc.. There is also some cloudy days, parking in the shade, etc... to overcome. So I went with 250 watt panel. But I do think 150-200 watts would have worked ok too as long as I was careful. I originally had 270 watts of flexible panels, but my glue down job was subpar and the panels were not well constructed for this type of use. And they went flying off my camper during the first trip. So now, I have a heavy, big, and rigid panel. Here are some pictures of my handy (sort of) work. One question. 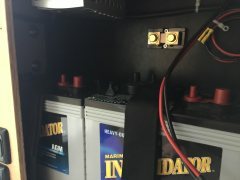 Do you have your truck wired up to charge your batteries when you're driving? Or is it that you spend several days in one spot? We will often stay in one location for several days at a time. 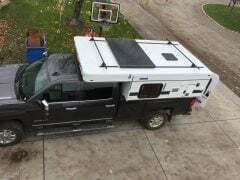 The truck does charge the camper. In my prior setup, I was able to get around 15 amps/hour of charging while driving. I believe that will be about the same this time, but I have not directly measured it yet. Nice job DrJ! Also, a very realistic analysis of the system sizing. I am curious on what kind of panel is that new one? 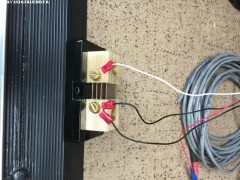 12v or 24v and what is your charge controller? 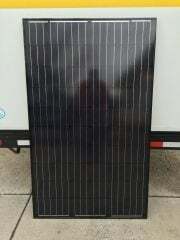 New panel is Renogy 24 volt 250 watt panel. I have a 20 amp MPPT charge controller - which was necessary for a 24 volt panel. I chose the panel because I could get it from amazon and it was wider than my yakima tracks. So it made it very easy to attach the panel to the tracks and not drill into the roof. Nice panel. I am going to add another 100w to the top of my Hawk. If I knew what I know now I would have gone the 250w panel and mppt controller. I like how it spans the tracks, I have to use alum angle to reach the tracks. Wow drj, nice set up. When over kill is under rated, I think I'll check with you before I add a system on my truck. Are you planning on adding any kind of inverter so you could run 110? About the only thing your missing from your system is a tv. I have been thinking about that - or even a small microwave like you want to do. 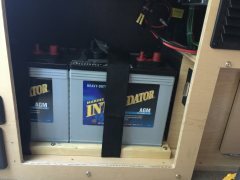 A TV would be great (or at least my kids would think so) but I'd probably just do a 12 volt unit if I didn't do the inverter. I'm thinking where to mount a tv in my grandby. If I could some how mount to my rear lift panel would be the ideal space. Any one else mount a tv in their campers? Great evaluation and appreciated. Estimating solar hours seems difficult considering the orientation of the panel [s] on the roof; let alone the sky cover differences. Your empirical data makes sense. We will order a Hawk on 11/18 with the 160W fixed and 80W portable panels. Here at home 45.407N/117.261W with an array of 22 280W panels [@230 degrees] we see enormous differences in KWH production. 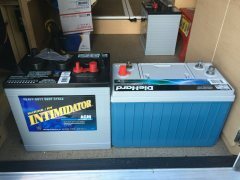 I hope and trust the Hawk system will keep us up and running for at least 3 days in one location [with OEM double battery set up/furnace/110L 2 way]. Time will tell. Your average power use was very helpful.